image courtesy of the window seat. by now i’m sure most of you have heard of the whole legal quandry surrounding pinterest and their less than acceptable legalese. for those of you who haven’t, in short their legal agreement has huge holes which in the long run leave you the user holding the bag with regards to copyright issues. you can’t post images that you don’t have copyright or permission to use yet you shouldn’t use pinterest for self promotion only. huh? doesn’t leave you very far to go does it? 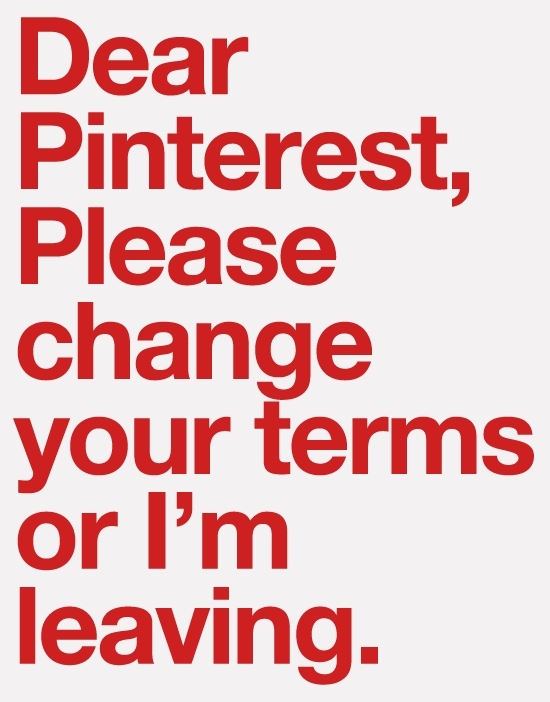 furthermore, should any individual decide to file suit against pinterest, the legal is written in such a way that leaves you solely responsible! not only are you on the hook but according to their legal, by using their site, you also agree to pay for any legal representation for both yourself and pinterest. really, how many of us actually read the legalese when agreeing to use an app or site? you can get the skinny on the whole situation here. needless to say, that leaves me very sad as i’ve found pinterest to be extremely helpful from a design point of view. working freelance allows me to share trend boards with my design partner and coupled with skype, she and i can tackle projects without ever having to lay eyes on each other. not to mention the fact that i simply love pulling together inspiring images for my own satisfaction and promoting the work of others at the same time! some folks have chosen to go blindly ahead with the whole “that will never happen to me” mentality but i’m sure many of the users of napster wished that they had paid attention when the rumblings of copyright infringement began. i seem to recall a 12 year old being a sued as well…. for those of us who blog, never fear as there appears to be an exception to the rule albeit slight. apparently there is the ‘fair use defense’ which allows for criticism and commentary on works in the ‘digital millennium copyright act’. forbes weighed in with their two cents which helps to further shed light on the situation. i’m hoping that some kind of satisfactory resolution will be found which can get us back to pinning without the threat of litigation. perhaps offering pinterest as an offline app or a private cloud based tool which you can use for personal use. one where only the pinner can see and utilize the boards. until then, i’ll have to continue the hype from here, one post at a time!